Please note that a pre-authorization is being process prior arrival in order to make sure that card is valid. We need a valid credit card to guarantee your booking request, if a valid credit card is not provided, the booking will be cancelled and the deposit will not be refunded. 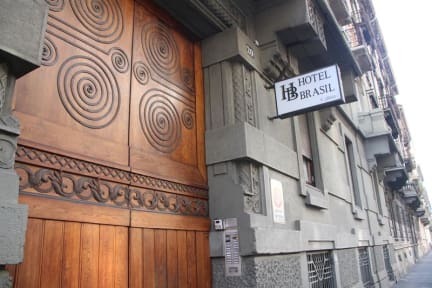 The Hotel Brasil is excellently located for moving around the city: positioned between the Main Train Station and Duomo linked by metro-bus to the main places of artistic and cultural interest in the city . FREE WIFI Pets Allowed, 24 hour Front Desk, Family Rooms, Safety Deposit Box, Heating, Luggage Storage,internet point. For the sake of providing the best possible service we speak English, French and Spanish, in addition to Italian. Smoking is allowed in the rooms only. Good, no frills hotel. Clean and comfortable private room. 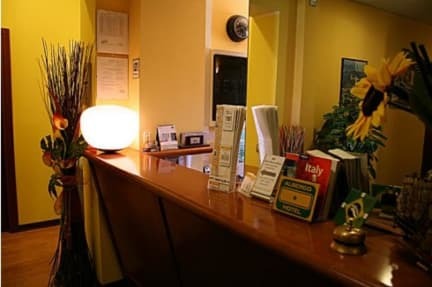 Doors lock at night, need to ring the buzzer to be let in since you are not given a key to the outermost door - they might not respond immediately, but we always saw someone at the desk. Nice place, near bus stops and cafes. Location is good, near bus station. But it is located on the 5th floor ( 4th floor as they call it ) no elevator. Theres no lights at the stairs going to the hostel. Was kinda aftaid of going up and down. Old house mansion renovated. The room was ok. Enough of what we paid for. Just didnt like going up and down, with no lights at the stairs and elevator. I got private room but didn’t like that there wasn’t a bathroom. Overall a good place. No A/C but they provide you with a fan. Did the job well, don’t like that you have to leave the room key at the front desk, just a few bus stops from the train station. About a 20 minute walk. Reception was not friendly at all. The night reception does not speak English despite what their page says. Bathrooms are decent sized, but have the lowest water pressure and the shower head has to be held up. Worth a one night stay for value. We did a 4 bed, you get 1 double and 3 twins. Also my biggest dislike is their luggage storage is not a room its just " behind the desk" which is just a small hallway. I would not stay again. There's no facilities except a fridge. There's no common area for travellers to meet. If you arrive late at night it's pitch black and you have no idea how to get up. Some members of staff had no English. It's an hours walk from the cut centre and the staff weren't that helpful for stuff to do.